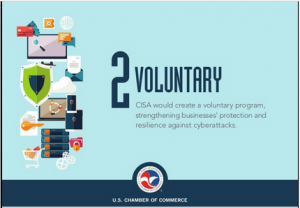 The Chamber of Commerce has a blog post pitching CISA today. It’s mostly full of lies (see OTI’s @Robyn_Greene‘s timeline for an explication of those lies). But given Sheldon Whitehouse’s admission the other day that the Chamber exercises pre-clearance vetoes over this bill, I’d like to consider what the Chamber gets out of CISA. 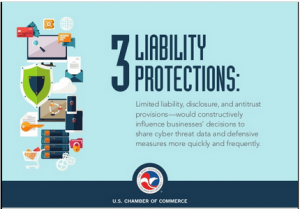 It claims the bill, ” would help businesses achieve timely and actionable situational awareness to improve theirs and the nation’s detection, mitigation, and response capabilities against cyber threats.” At least according to the Chamber, this is about keeping businesses safe. Perhaps it pitches the bill in those terms because of its audience, other businesses. But given the gross asymmetry of the bill — where actual humans can be policed based on data turned over, but corporate people cannot be — I’m not so sure. Particularly given increasing calls for effective cybersecurity legislation — something with actual teeth — at least for cars and critical infrastructure, this bill should be considered a corporatist effort to stave off more effective measures that would have a greater impact on cybersecurity. That is borne out by the Chamber’s recent 5 reasons to support CISA post. It emphasizes two things that have nothing to do with efficacy: the voluntary nature of it, and the immunity, secrecy, and anti-trust provisions in the bill. That is, the Chamber, which increasingly seems to be the biggest cheerleader for this bill, isn’t aiming to anything more than “situational awareness” to combat the scourge of hacking. But it wants that — the entire point of this bill — within a context that provides corporations with maximal flexibility while giving them protection they have to do nothing to earn. 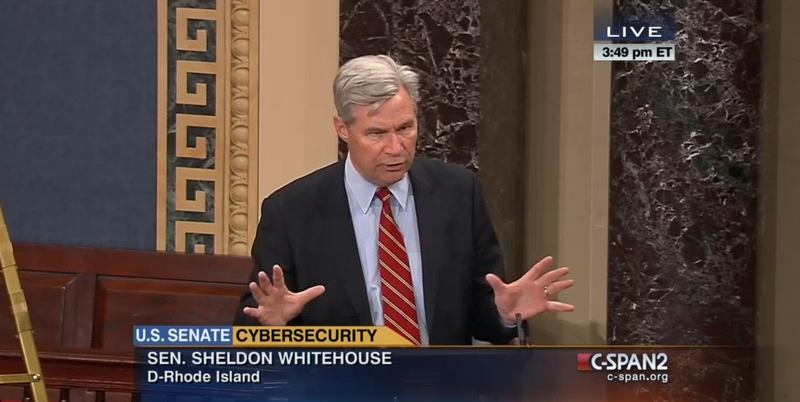 CISA is about immunizing corporations to spy on their customers. That’s neither necessary nor the most effective means to combat hacking. Which ought to raise serious questions about the Chamber’s commitment to keeping America safe. As I laid out yesterday, Mitch McConnell’s victory lap made it clear he plans to set up ObamaCare — the individual mandate — as a key campaign issue for 2016. There were another few details from that speech that were very telling. First, McConnell said he would roll out tax reform — that is, very large tax cuts for corporations. That’s clearly payback for the Chamber of Commerce, which had a very critical role in the GOP’s success, according to this great article from the WaPo. Seven minutes in, the meeting was over. Of course, that’s going to leave a hole in the budget. Eliminating the medical device tax — another tweak McConnell promised to make to ObamaCare — will create another hole in the budget. McConnell revealed part of how he was going to fill it with his response to a question about the Democrats’ filibuster reform. He noted that the Senate doesn’t need 60 to get things done for some issues. He noted they can use reconciliation and push stuff through with just 51 votes. The GOP has spent 4 years complaining that the Democrats pushed ObamaCare through using reconciliation. But it took just 15 hours after winning the majority for McConnell to make clear that he plans to push through aggressive ideological legislation using the same tool. Still, all the cutting in the world isn’t going to make up for steep drops in corporate tax cuts. Which means — as always happens when Republicans are in charge — we should expect the deficit to start growing again. Last night, Jefferson County, AL delayed their decision for a month whether to declare bankruptcy or accept a settlement with their creditors and the state. At issue is $3.2 billion in debt, much of it for a sewer upgrade, that got dragged into the financial crash. The current deal would have creditors forgo a third of the debt in exchange for rate increases and the creation of an independent authotiry to run the sewer. County commissioners balked, though, arguing the deal relied on too many contingencies from the state–none of which are guaranteed–and took away any control at the county level. In short, it’s a mess, one that is costing the people of Jefferson County in increased rates and diminished services as the county struggled to find funding mechanisms to pay for the debt. Yesterday, Reuters did a report summarizing all the bribery that went into the original sewer deal–and noting that JP Morgan hasn’t paid any reputational damage or loss of business for it, largely because it has blamed the deal on corrupt local officials. JPMorgan Chase & Co. (JPM)’s Charles LeCroy said the key to landing bond deals in Jefferson County, Alabama, was finding out whom to pay off. In one example, that meant a $2.6 million payment to Bill Blount, a local banker and longtime friend of County Commissioner Larry Langford. “It’s a lot of money, but in the end it’s worth it on a billion-dollar deal,” LeCroy told a colleague in 2003, according to a complaint filed by the Securities and Exchange Commission. Just 21 months ago, JPMorgan agreed to a $722 million SEC settlement to end a case over secret payments to friends of Jefferson County commissioners. The financings arranged by JPMorgan, a package of floating-rate debt and derivatives, exposed taxpayers to the 2008 credit crisis and dealt a blow that may lead the county to approve the biggest U.S. municipal bankruptcy as soon as today. I have a feeling I’ll be doing a lot of these posts, showing how Hunton & Williams asked “Themis” (the three firm team of HBGary, Palantir, and Berico Technologies) to apply counterterrorism approaches to combat First Amendment activities. This particular installment comes from an early presentation and accompanying proposal Themis prepared for Hunton & Williams. These documents were attached to an email dated November 2, 2010 sent out by Berico Technologies’ Deputy Director. He explains that the presentation and proposal would be briefed to H&W the following day. The Powerpoint includes a slide describing the purpose of Themis’ pitch to H&W. Purpose: Develop a corporate information reconnaissance service to aid legal investigations through the open source collection of information on target groups and individuals that appear organized to extort specific concessions through online slander campaigns. Now, this is in the period when H&W was only beginning to discuss the Chamber of Commerce project with Themis, long before the BoA pitch. That is, this is the period when they were discussing generalized opposition to Chamber of Commerce. And of that they got “extortion”? “slander”? Team Themis will draw on our extensive operational and intelligence experience to rapidly make sense of the volumes of data we’ve collected through the application of proven analytical/targeting methodologies. Drawing on the principles and processes developed and refined by JSOC in the “Find, Fix, Finish, Exploit, Analyze” (F3EA) targeting cycle, we will develop and execute a tailored CIRC intelligence cycle suited to enable rapid identification/understanding, refined collection/detection, focused application of effects, exploitation, and analysis/assessment. Mind you, this is just a fancy graphic for “analysis”–the kind of stuff civilians do all the time. But Themis–led by Berico Technologies in this case–decided to brand it as a JSOC (Joint Special Operations Command) product, applying an American unconventional warfare model to targeting political opponents engaging in free speech. This is a bunch of veterans proposing to go to war against citizen activism on behalf the Chamber of Commerce and other corporations. The proposal also highlights the JSOC experience of one Palantir team member. He commanded multiple Joint Special Operations Command outstations in support of the global war on terror. Doug ran the foreign fighter campaign on the Syrian border in 2005 to stop the flow of suicide bombers into Baghdad and helped to ensure a successful Iraqi election. As a commander, Doug ran the entire intelligence cycle: identified high-level terrorists, planned missions to kill or capture them, led the missions personally, then exploited the intelligence and evidence gathered on target to defeat broader enemy networks. Berico Technologies is a technical and analytic services firm that helps organizations better understand information critical to their core operating objectives. Our leadership does not condone or support any effort that proactively targets American firms, organizations or individuals. Late last year, we were asked to develop a proposal to support a law firm. Our corporate understanding was that Berico would support the firm’s efforts on behalf of American companies to help them analyze potential internal information security and public relations challenges. Consistent with industry standards for this type of work, we proposed analyzing publicly available information and identifying patterns and data flows relevant to our client’s information needs. Yet it was Berico Technologies’ Deputy Director who sent out these documents adopting a military targeting approach for responding to citizens engaging in free speech. I noted yesterday how mind-numbingly ignorant analysis of Glenn Greenwald’s motivation as a careerist hack that was provided by HBGary. And if the allegations in the excerpts of former WikiLeaks volunteer Daniel Domscheit-Berg’s book are accurate, HBGary’s analysis about WikiLeaks itself is even more ignorant. Add in the fact that this “security” company got hacked in rather embarrassing fashion. Which, I’m guessing, is going to cause the Chamber of Commerce to rethink the spying work with HBGary it apparently has been considering. Let me start with this caveat: what follows is based on emails available by Torrent. The parties in this affair are making claims and counterclaims about the accuracy of what is in there. But it appears that back in November the same parties involved in the pitch to Bank of America–Palantir, HBGary Federal, and Berico Technologies working through Hunton and Williams–started preparing a pitch to the Chamber of Commerce. At that point, HBGary started researching anti-Chamber groups StoptheChamber.com and USChamberWatch. At one point, HBGary maps the connections between SEIU, Change to Win, and USChamberWatch as if he’s found gold. On January 13, HBGary believed they had signed a contract. This afternoon an H&W courier is bringing over a CD with the data from H&W from phase 1. We are assuming that this means that phase 1 is a go (We’ll let you know once we confirm this) and I’m wondering how we will integrate that data. Should we bring the CD over to Tyson’s Corner? On February 3, law firm H&W came back to the three security firms and told them they’d be doing their Phase I work on spec, until the Chamber had bought into the full project. At that point, the firms put together a plan including a proposed February 14 briefing. In response, Aaron Barr boasted (as is his wont) that his upcoming presentation at BSides security conference on Anonymous should be proof enough. Let them read about my talk in two weeks on my analysis of the anonymous group. Should be proof enough. But willing to discuss. Which gets us just about to the point where Barr blabs his mouth, this security firm is badly hacked, and the Chamber of Commerce’s efforts to use intelligence firms to investigate activists exposing the Chambers own work is revealed. I’m guessing HBGary just lost that contract, how about you?